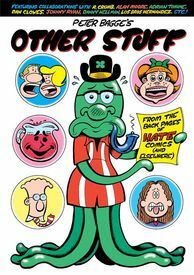 Long suffering Pete Bagge fans who pine for the good ol' pre-Libertarian days of Mr. Bagge's deeply incisive satirical wit can put away their handkerchiefs and weep no more as this collection delivers all the difficult-to-get-a-hold-of odds-n-sods in one tidy package! (Along with a sampling of works of more recent vintage.) Be sure to take a gander at this healthy PDF preview that includes the table of contents, so you can know exactly what you're getting here.